BlackBerry's security secret - Hardware Root of Trust | BlackBerry Blast! Although BlackBerry is struggling to stay relevant in a world of iPhones and Android devices, the former top dog in the smartphone market continues to focus on its strength. According to BlackBerry, they have the best security on the planet. In fact, Jefferies analyst Peter Misek has previously claimed the BlackBerry was NSA proof. Heads of state like Barrack Obama, David Cameron, and Angela Merkel, all use BlackBerrys. Is that a coincidence? BlackBerry has been known to have security integrated in the hardware and software which makes it supposedly impossible to hack. BlackBerry's manager of security services, Alex Manea, explained in a blog post how the company integrates security into its hardware. Manea says, "Hardware Root of Trust is the foundation of BlackBerry security." The CPU Embedded Boot ROM verifies the digital signature of the Boot ROM. The Boot ROM verifies the signing key of the Operating System. The Operating System verifies the hash of the Base File System. 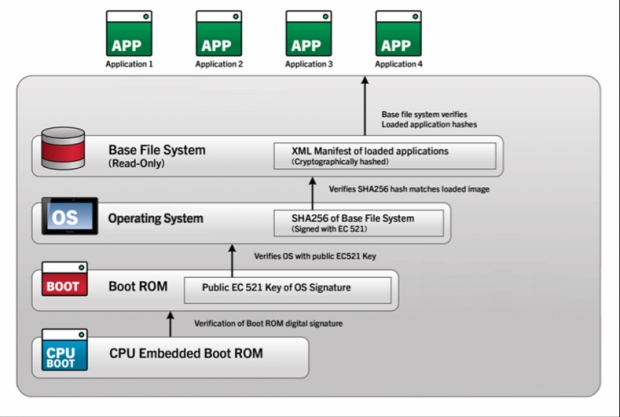 The Base File System verifies the hashes of all loaded Applications. I don't know about the NSA proof claims, but BlackBerry does have very strong security. In the post-Snowden world they should be touting security as loud and as often as they can.